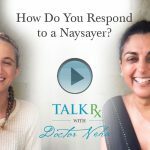 How Do You Respond to a Naysayer? Get FREE videos that answer your everyday health and relationship dilemmas! Learn How To Have A Distinct Advantage in Every Conversation!